A breeder can and will provide evidence of genetic testing on the parents, and will be a source of information and support throughout the life of your dog. The breeder will also provide a resource should you, at any time, be unable to keep your dog. I was told I would get a price discount if I didn’t want registration papers, is that ok? The Canadian Kennel Club (CKC) and its members are governed by the Livestock Pedigree Act, which stipulates that registration papers must be supplied on all purebred dogs sold. This is also set out in the CKC and the PWCAC Codes of Ethics - thus all members must adhere to that stipulation. A dog without registration papers is NOT considered a purebred, regardless of its lineage. It is unlawful to sell a dog as purebred without registration papers. The breeder wants me to sign a contract, what does that mean? It is customary to have a contract/guarantee which will document the responsibilities of both the breeder and the new owner with respect to the puppy. Contracts typically include a health guarantee & return policy for example. If I get two puppies at once will they keep each other entertained? General thought is that two puppies from the same litter will bond more closely with each other than with their person(s). It takes extra work to raise two puppies of a close age (rather like raising twins). Generally, raising one puppy to the point of them being housebroken and reliable before adding a second is the easiest course of action for all. What shots should my puppy get? Generally, the puppy will receive its first set of shots while in the care of the breeder. Your vet should be consulted to determine the remaining vaccination schedule, and other issues such as parasite and pest control. How old should my Corgi puppy be before I take them where they can play with other dogs? Puppies should be kept away from other dogs until at least their second set of shots. At that point they have partial immunity to some deadly diseases. Exposure to carefully selected playmates may be appropriate at that time. Trips to places where there may be many dogs are should be limited until 2 weeks after the 3rd set of shots. At that point your puppy should have good immunity to a variety of communicable and deadly diseases. 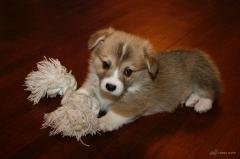 How long will it take to housetrain my Corgi puppy? This varies in direct proportion to the time and dedication put into the training. Generally, the puppy should be reliably trained by approximately six months of age. Should I spay/neuter my corgi? Yes! The PWCA(C) highly recommends the spaying/neutering of companion animals. Most breeders will only sell companion puppies on a non-breeding contract and on a non-breeding registration with the Canadian Kennel Club (this means that if puppies result from a dog on a non-breeding registration, the puppies are unregistrable and thus not considered purebred regardless of the parentage). You will be expected to spay/neuter your puppy at an appropriate age as determined by your vet and breeder. Neutered animals typically live longer and healthier lives than those left intact as they are at lower risk for developing serious medical problems. Reputable breeders are only breeding to improve the breed, not for profit or to have the children experience the miracle of birth.